Our range of Dense Phase Vessels is manufactured with mild steel and these are dense phase transporters. These are used for conveying high capacity for longer distances normally at lower speeds and a material to ratio as high as 8 times of Dilute Phase Systems. We have a wide range of dense phase transporter that is designed as per the accepted industry standard and is widely used across various industries. 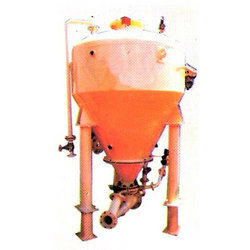 We can also provide the customized range of these Dense Phase Vessels on the specifications of the clients. We manufacture and export a wide range of Material Handling Equipments, Pneumatic Conveying Systems, Big Bag (Jumbo Bag) Filling & Unloading Systems and Dust Extraction Systems. These are efficient, durable and highly effective.